With the fall season in full swing and the holidays right around the corner, I’m sharing this year’s free printable holiday planner for a limited time! With 8 weeks of checklists and ideas to help you plan and organize your home, you’ll be able to focus on what really matters. I know it’s only October, but soon the holidays will be fast approaching! I can hardly believe the year is winding down and it’s just a few weeks until Christmas! If you’re wanting a to simplify your holidays and organize your days so you can enjoy your family time more, this planner will help you do just that. 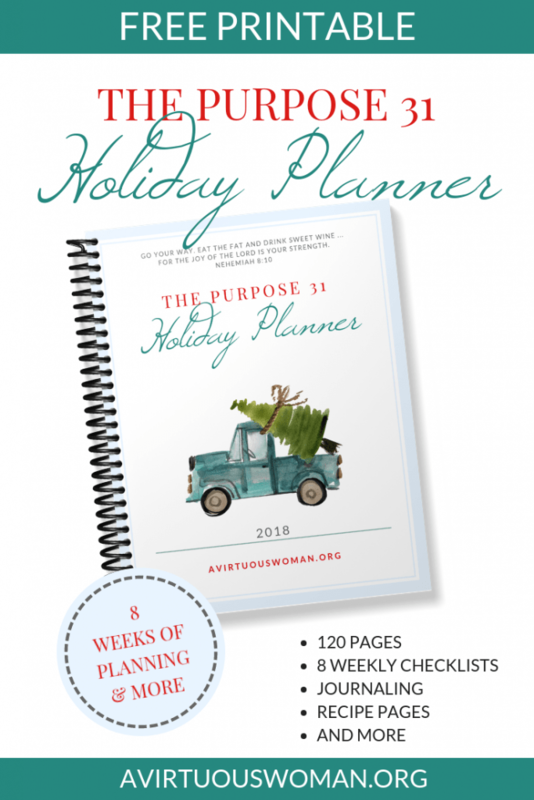 The Purpose 31 Holiday Planner is packed with 120 pages to help you plan and organize your holidays over an eight week period. With eight weekly to do lists for cleaning, holiday preparation, and holiday shopping, you won’t find yourself scrambling at the last minute to get it all done. There are calendars, bucket lists, shopping lists, recipe pages, gift lists, and more to help you keep track of everything you need to remember, plus you’ll find space to record all of your special holiday memories, past and present. This planner is for just what you need to get organize, enjoy your days, and plan your holidays with simplicity. 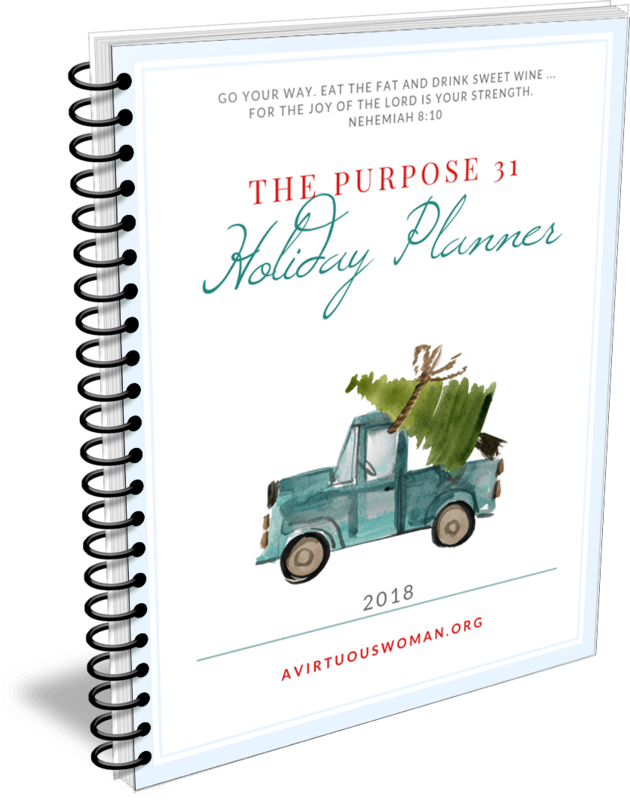 Just fill out the form below and you’ll receive your own copy of The 2018 Purpose 31 Holiday Planner right to your email box! Join A Virtuous Woman's community of over 21,000 women where you'll find freedom from perfection and the confidence to live your life with purpose. 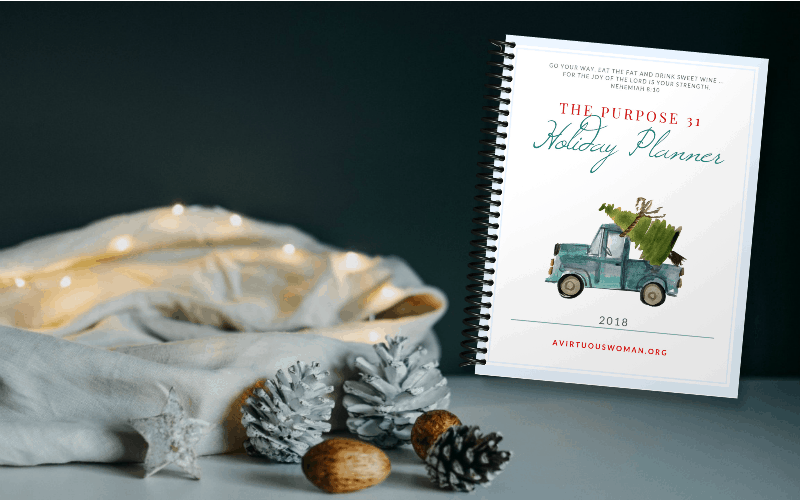 Get my FREE PLANNER: The 2018 Purpose 31 Holiday Planner!